Danno is from our D litter which consisted of 9 pups born and raised at our house on the 24th May 2016. Mum Sasha and father Lenny were both living with us at the time. 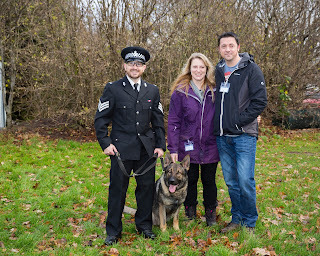 Lenny has since gone onto be a Police dog based in Exeter and Sasha has gone to live with full time carers and friends of ours Julie and Les who live in Bath. Sasha will return to us if she has another litter but eventually she will be signed over permanently to her carers Julie and Les. Sasha and Lenny were excellent parents and the pups no doubt benefited greatly from having a father figure around. Danno is the pup coming out from behind the shed with the tartan collar. In the early weeks after the litter was born Sasha would let Lenny pop his nose in to see the litter but she wouldn’t let him get to close until they were a bit bigger. Just like our A, B and C litters the pups had the best possible start being raised in a home environment. They had the run of the garden to explore and a constant stream of visitors. Here are some of the photo’s of their time with us. Donna pictured here with mum Sasha was without doubt her most troublesome pup. She constantly went off exploring and mum regularly had to find her. Despite having her own sofa and viewing platform Sasha loved squeezing herself into this tiny cardboard box which I used to store the plastic bin liners. Here are the pups relaxing in the garden without a care in the world. Here are the lovebirds having some quality time together cooling off in the paddling pool. Here is Danno on his last night before going to his new puppy walkers the next day. We couldn’t keep all of the pups and so we sold 3 of the pups Dora, Dot and Darcy and kept 6 for the puppy program. The 3 pups we sold are all doing well. Here are all the pups going to their new owners and puppy walkers. Here are the pups pictured on their first training day. Danno is first on the left with puppy walker Luke. 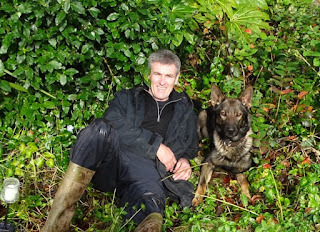 Danno and all of the pups were regular attenders on all of our training days. The D litter turned out to be a very healthy, athletic, robust litter with nice temperaments, good working drives and a pleasure to own. From a German shepherd breeders point of view a very successful litter. Here they are at the Devon County show mixing with all the crowds, other dogs, animals, noises and sights without any issues whatsoever. Danno is on the right. It was quite an impressive sight-seeing them all making their way through the busy crowds together interacting very sensibly with all the hundreds of dogs walking around. I was very proud of them. Sadly with regard to Duke, Donna, Daisy and Dizzy despite their many good qualities at the time of their assessments they didn’t pass their boldness and resilience tests and couldn’t therefore be accepted for an Initial Police dog course. I am desperately disappointed for the puppy walkers because they all put so much time and effort into developing and raising their pups. Here we all are on our farm visit which is always a favourite of mine. All of the pups were very confident and well behaved. I am surprised that more of them didn’t progress to become Police dogs because they all did so well during their development period. Also both parents have excellent all round qualities. Naturally we would have liked more Police dogs from the litter but on this occasion the combination didn’t work as it did with our A, B and C litters. But they were still an excellent example of healthy good looking German Shepherds with good temperaments. Dizzy and Donna were kept by their puppy walkers and Duke and Daisy both went to excellent new homes. All 4 pups are doing well in their new homes. 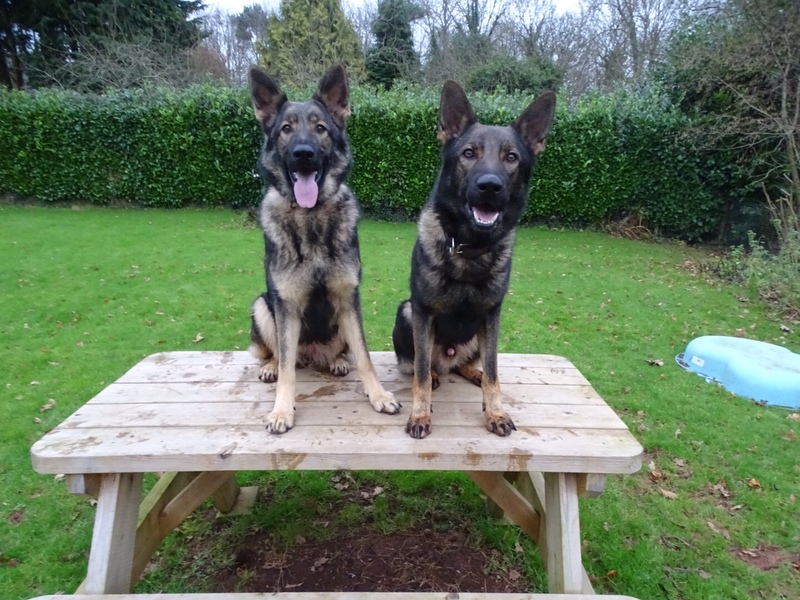 Devon and Danno had been consistent performers throughout their development period and both were selected to start the September 2017 Initial Police dog course. 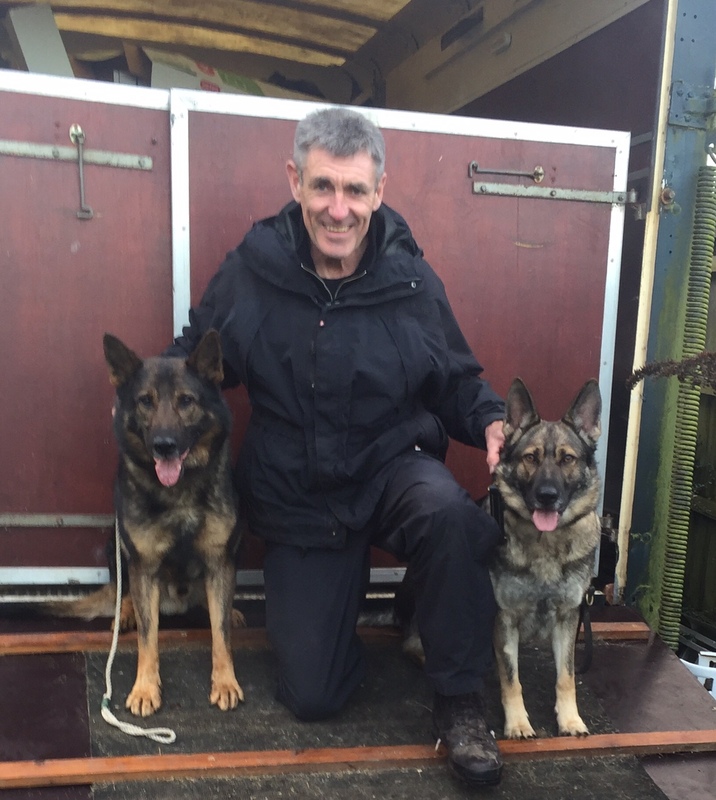 They were allocated to their new handlers Kevin Roberts and Kevin Riger a couple of months before the course to prepare and bond. Here are Devon (Left) and Danno (Right) at the start of the course. 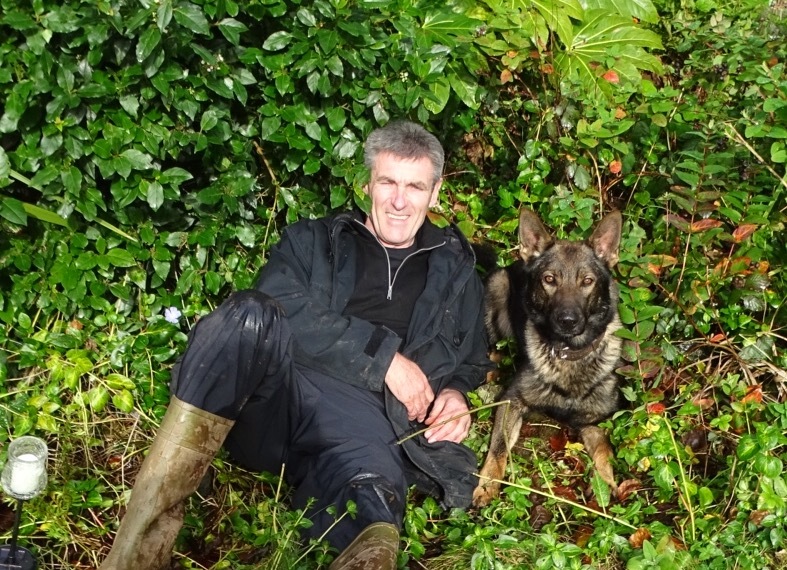 Unfortunately Danno was released from the course in week 6 because he didn’t seem to have enough focus and determination on some of the exercises. 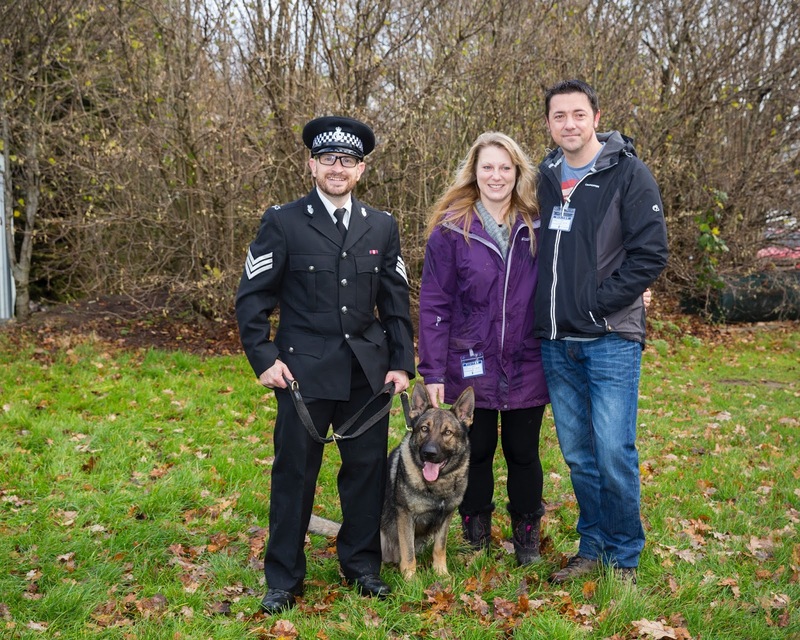 Kevin Roberts and Devon successfully passed their course and are pictured here with puppy walkers Lindsay and Anthony. After being released from the course Danno came home to live with me to give me time to assess him and decide on the best possible future home for him. 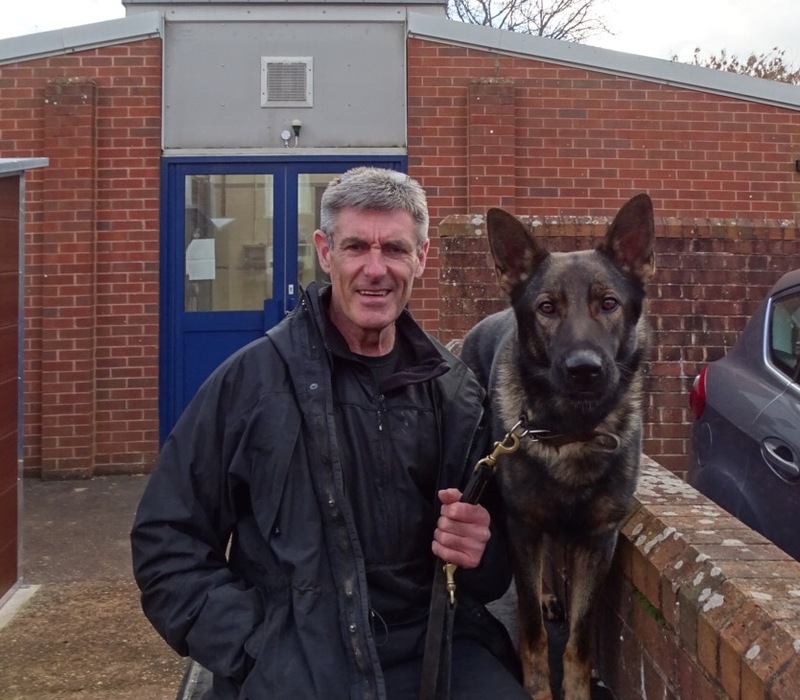 Even though he knows me well I could see he had lost confidence and was affected by having been moved from his handler Kevin who he clearly adored. My 10 month old female Ella certainly helped him to settle in with lots of chase me games and they quickly became good pals. With regular play sessions and regular walks with me he really came out of himself and as is so often the case he has become a different dog. 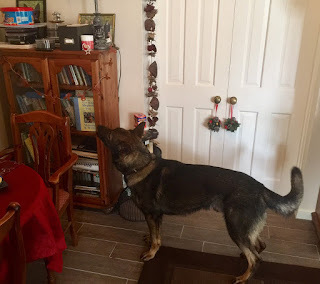 I have been doing a lot of the exercises with him that he was doing on the Initial Police dog course because he loves to work and engage and like all energetic dogs he needs an outlet for his energy. The issue of a lack of a determination and focus that he had displayed on the course has not been a problem since he has been with me. On the contrary his determination and focus has been outstanding which would tend to suggest to me that he had found aspects of the course stressful. In the 3 months he has been with me I have found him to be a very sweet natured dog who clearly doesn’t want to upset anyone and would do anything to avoid conflict with his handler or owner. He will stay close to me and is always looking to me for guidance or the opportunity to play. He has met young puppies that I have brought to the house and he is very gentle and friendly towards them. He is an absolute gentleman with my 10 month old female Ella and he will regularly step aside and allow her access to the water bowl or a bone rather than have an argument. He enjoys being groomed, I can examine any part of his body, he is happy being lifted up, he readily gives up his toy, allows you into his food bowl and will even give up a juicy marrow bone without a hint of possessiveness. He loves his home comforts and is very persistent in letting me know when he would like something from his toy box. He is not a nervous dog with regard to the environment ie sights, sounds, noises etc but he does have a mistrust of strangers. He can become uncomfortable when on a lead if people he doesn’t know come too close, stare at him or try to stroke him. This is without doubt due to a lack of confidence although you wouldn’t have thought so seeing him at the Devon county show. Off lead this doesn’t occur because he doesn’t feel trapped. In fact in the garden he will happily run down to our gate to investigate delivery persons and there isn’t a hint of aggression from him. Even on lead providing he is setting the agenda and he is comfortable there is no issue with him. Because he is a dog who is alert to every sight and sound and has a mistrust of some strangers he would be described in working circles as a dog having an edge or sharpness in his character. There are dogs like him who are very successful in Service dog sections because they are highly aware and switched on. But if that sharpness is not built on confidence then no matter how good they are in their work in my opinion it is a mistake to train such dogs to bite people. Quite the opposite such a dog needs as much socialisation as possible to improve his confidence and make him more relaxed with people in all circumstances. Danno is pictured here with puppy walker Luke in the navy cap. I have no doubt with careful management and with a handler who understands him and has his trust he could still pass a Police dog course but in my opinion it would be the wrong career for him. Here he is tracking with puppy walker Mitzi. Danno would be happiest as a companion dog with a kind understanding handler/owner /family who I know he would adore. But equally he needs someone with experience of handling a large energetic dog. Here he is again with Mitzi. I have started the process of socialisation in and amongst strangers and already he is improving in confidence every time I take him out. Initially he was a bit of a puller on lead and so work was needed in a quiet area with no distractions. It was very important that Danno understood what was required of him ie walking in a relaxed manner on a loose lead without pulling BEFORE going that into a more distracting environment. It is quite stressful for a dog going into busy city centres and so it is important that the dog can relax and enjoy the experience. Knowing exactly what is required of him/her ie walking on a loose lead and ignoring distractions is important and so are regular breaks to relax and interact with the handler. Regular titbits for good walking and stopping in different positions also improve the experience. Also good communication ie letting your dog know you are pleased with his performance is also very important. Little and often is also going to make him to want to repeat the experience. Its been much easier for me to achieve speedy results because of the excellent work already carried out on the Initial Police dog course with his previous handler Kevin and trainer Graham. I will be sorry to part with this delightful dog but in my current role I regularly have dogs on assessment which makes it difficult for me to give him the attention and time that he needs. Here he is with puppy walkers Colin and Mitzi. Ideally I think he would be happiest in his own home where he is the only dog. He does get on with other dogs but he is the type of dog who craves the one on one attention and pleasure that he would derive from it just being him and his adored leader and owner. One thing is for sure his puppy walkers Colin and Mitzi couldn’t have done more in terms of giving their time, training, socialisation and a loving home. That is true of all of the puppy walkers of the D litter and I have many great memories of our time together. I would like to take this opportunity to thank all of my puppy walkers with the D litter for their hard work and dedication. 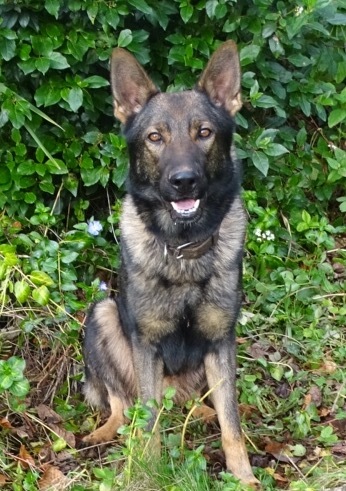 I would also like to thank everyone who has provided a loving home to all the pups from the D litter. From Danno, Ella and me bye for now.